When he was in school three years ago, Mr Arturo Neo was called into his teacher's office. But he was not scolded for doing something wrong - instead, he was offered cash and kind words. His Hwa Chong Institution teacher, Mr Joseph Sim, knew that the teen - the youngest of three children in a single-parent family - was struggling financially, and wanted to help with the expenses of an upcoming overseas school trip with his own money. Mr Neo refused the gift of about US$300 (S$375) at first, but Mr Sim told him: "I'm helping you now, so you can come back and help us next time." The incident touched Mr Neo, who was also an Education Ministry bursary recipient. It was just one of the many times he had been offered a helping hand, he said. Now Mr Neo will finally get the chance to pay the debt forward. 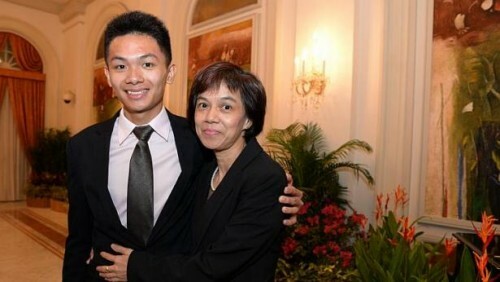 The 19-year-old was one of five young Singaporeans who were awarded the prestigious President's Scholarships this year at a ceremony at the Istana yesterday. The scholarship recipients were picked by the Public Service Commission for their outstanding academic and co-curricular achievements, character and leadership potential. They are the latest in a long line of President's Scholars, going back to 1966. Mr Neo, who will read Medicine at the National University of Singapore, said the scholarship will allow him to "make a positive impact on people's lives". "As a doctor, you get to help people in a personal way by relieving emotional and physical pain," he said. Growing up, Mr Neo was no stranger to adversity. His parents divorced when he was two, and he grew up in a three-room flat in Yishun with two elder siblings. Mr Neo's mother, Madam Ng Mui Soo, 51, supported the family on her monthly income of $1,500 as a childcare teacher. The experience taught Mr Neo to be independent and live simply, he said, adding: "I didn't want my mother to worry about my studies." She did not have to. Like his fellow scholarship recipients, Mr Neo juggled both community involvement projects and his studies, and managed stellar grades. The other recipients are: Mr Brendan Dean Zhi Min, 20; Mr Tommy Koh Kit Shaun, 19; Miss Lee Zi Xin, 19; and Mr Eugene Lim Zhi Wei, 19. Miss Lee wants to study behavioural economics and work for either the Ministry of Trade and Industry or the Ministry of Social and Family Development when she returns. At the ceremony yesterday, President Tony Tan Keng Yam congratulated the recipients and told them to exercise "integrity, courage and commitment". "As public servants, you must engage the public constructively... hear the voices of our citizens and keep an open mind to the increasingly diverse views that Singaporeans hold," he said.